Welcome to Academy of Sound's June Newsletter! After a short time away from the Newsletter, we are back and summer is on its way! Make sure you have registered for our SUMMER SESSIONS! We are looking for 14-30 more students to be in the AOS Summer Musical "Disney's Cinderella KIDS" directed by Elisa Kaether. This three-week class will focus on learning the songs, script, and choreography for a 30-minute kids version of Disney's Cinderella -- A spell-binding story, with charming music and endearing characters that will enchant and live in your heart forever. Including favorites "A Dream Is a Wish Your Heart Makes" and "Bibbidi-Bobbidi-Boo." Performance date TBD. Fee does not include costume or accessories, but we will do our best to keep these low-budget, and mostly items you likely have already. Children must have completed Kindergarten to enroll. We have one new and two returning staff members for our SUMMER SESSIONS! Our newest faculy addition is Kirstin Roble teaching our voice students beginning June 12. She has openings, and accepts students age 8 and up! We also have Olivia Podnar and Elisa Kaether returning to us this summer. Olivia will be teaching piano and Elisa will be directing our Disney Cinderella KIDS play! 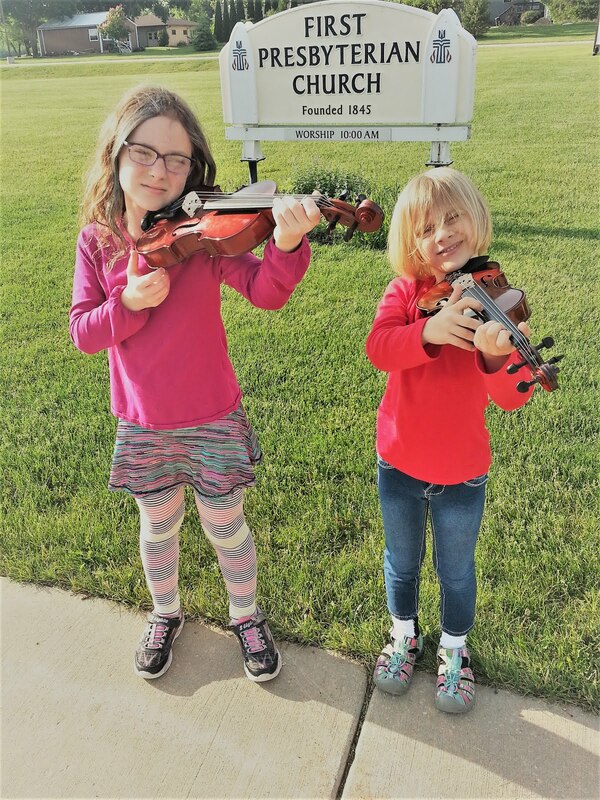 July 27, 7:00 PM - Academy of Sound's Production of "Disney's Cinderella KIDS"
Siblings Lorenz and Lucy Fradken-Annen were both nominated to be the featured students this month. 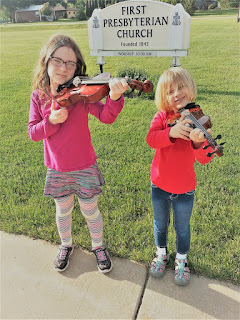 They both have been in lessons with Academy of Sound for two years - Lorenz plays the violin and Lucy plays piano and has started viola in the past year. They were both nominated for their enthusiasm, consistent practicing habits, and excellent performances. I got a chance to interview them both towards the end of last month, Here is a summary of our interview. Adam: Hello! You both were nominated for the "feature student this month. So, I wanted to do an interview with you guys so we could put it on our newsletter! Does that sound pretty good? Adam: Cool! We will go ahead and get started if that's ok! What are your names and ages? Lorenz: My name is Lorenz and my age is 6. Lucy: My name is Lucy and I am 9. Adam: Six and Nine years old. Okay, Cool! And what instrument do you play? Adam: Great! Do you have a favorite color? Adam: Purple is a good color! OK, what are your favorite songs to play? Adam: Oh, I like Fur Elise too!And who is the Etude by? Adam: OK cool! Do you have a favorite breakfast cereal? Adam: Tasty! You guys are big special K fans huh? Adam: Okay! One more thing before we go. You both got nominated to be students of the month because of your excellent practice habits and enthusiasm for playing your instruments. Do you have any tips that you could give to other students that might read the newsletter? Adam: What would you say is exciting about dynamics? Lorenz: They will get to play loud and quiet. Adam: And what does that do for your music? Lorenz: It helps people in the back hear! Adam: OK that's a good tip! Same question to Lucy. Lucy: Well for one thing, at concerts - just relax! You are going to be fine. Just think that no one else is there and try to play your piece thoroughly! Adam: Oh, I gotcha! Great! Well, thank you both very much for your time and letting me interview you! Is there anything else you would want to add before we go? Lorenz: I LOVE THE VIOLIN! One of the cool things about going to Academy of Sound is being able to see children transform into young musicians. Both Lucy and Lorenz are really great kids and I definitely foresee a future with music. We will be looking forward to watching them as they continue to develop their skills! Go to "add a calendar." On Google, this is "add a friend's calendar" or "Add a coworker's calendar." Hailed as a “mellifluous mezzo” (Mike Fisher, Milwaukee Journal Sentinel,) Mezzo Soprano Kirstin Roble is an accomplished performer in opera, recital, and musical theatre. A Minnesota native, Ms. Roble recently completed her Master of Music Studies at UW-Milwaukee. She previously earned a Bachelor of Arts degree from Luther College in Decorah, Iowa. Ms. Roble has performed with several Madison area and regional companies including Fresco Opera Theatre, Four Seasons Theatre, Madison Opera, Milwaukee Opera Theatre, In Tandem Theatre (Milwaukee,) Floating Opera Company (Chicago,) Opera on Tap- Milwaukee, Off The Wall Theatre, and Hartford Players. Ms. Roble is an eager collaborator of new works in opera and music theatre. Most recently, she took part in the NAXOS recording of The Great God Pan, a new opera by Ross Crean in Chicago. Other recent performances include Cherubino (Le Nozze di Figaro,) Ensemble (The Poe Requiem,) Maria (The Sound of Music,) and Zerlina (Don Giovanni.) As a teacher, Ms. Roble has worked with beginning piano students from five to adult and voice students ages eight through adult. Her patient, enthusiastic manner resonates well with a wide variety of interests and ages. Her students sing in top choirs at their schools, are leads in musicals, and have won talent competitions and scholarships. In addition, her students have also won honors at the WI State Solo and Ensemble Competitions. Supplementing work in the studio, Ms. Roble also teaches acting, character building, and improvisation. In addition to private studio teaching, Ms. Roble teaches musical theatre at First Stage Theatre in Milwaukee and is on the faculty at Beloit College. Ms. Roble is a member of AGMA and NATS. Elisa Kaether joined the Academy of Sound staff in 2013 as a receptionist. Having grown up around the studios all her life, she chose violin and drums as her primary instruments, while also studying piano, voice, and ukulele. Elisa has had roles in several productions, including Jack and the Beanstalk, A Toy Shop Christmas, Aladdin Jr., The Matchmaker, Spaghetti Island, and Once Upon a Mattress. Elisa started and lead the Oregon Youth Center Dance Crew for three years, and started and currently leads the female a capella choir at Oregon High School. She's helped with two children's musicals through Community Ed. Elisa was inducted into the International Thespian Society in 2017. Elisa studies at Oregon High School and plans to major in Music Education in college. Olivia Podnar began working as a receptionist at Academy of Sound in September 2013. Olivia has studied piano with Erin Chisman since 2004. She participated in choir in the Oregon School District for four years, as well as viola for one year. Olivia has had roles in A Toy Shop Christmas with Academy of Sound, Strega Nona with Children's Theater of Madison, The Emperor's New Clothes, Still Life with Iris with Oregon Straw Hat Players, The Trial of Goldilocks, Madrigal Dinner at Oregon Middle School, and The Drowsy Chaperone with Oregon High School. Olivia received a first rating at solo and ensemble on piano. Olivia has also been competitively figure skating since 2009. Olivia currently studies at Marquette University. Olivia has been teaching piano at Academy of Sound since 2014. Always contact the AOS office with scheduling questions and updates.